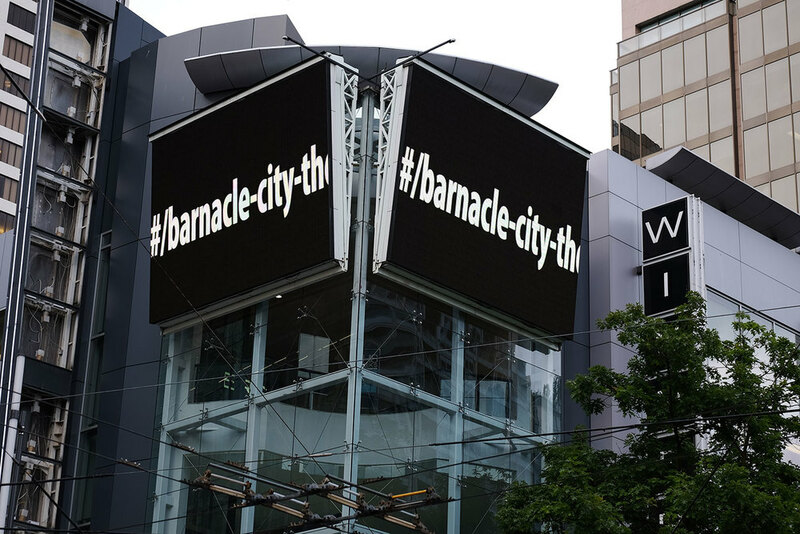 An image from Laiwan’s video Barnacle City—The Movie was additionally installed at the Canada Line City Centre Station at Granville and Georgia Streets in Downtown Vancouver from October 2016 to March 2017 at the end of the Coastal City Platform series. 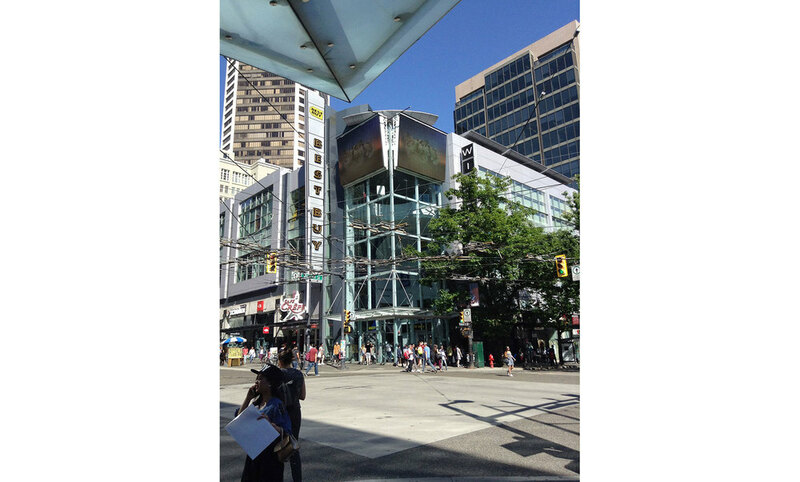 Visit the CanadaLine Public Art Series. Through oceanic metaphors organic and alive, juxtaposed with current scenes and structures of Vancouver’s cityscape, Barnacle City visually experiments with inquisitive and imaginative possibilities of a future city or a city that once had been, that is of a dream, a poem, of speculative fiction, perhaps alien. Barnacles as organisms that populate shorelines and coasts are fascinating. They live a sessile life where they are attached headfirst to the substrate and cannot move independently. I imagine once, millions of years ago, they were among more advanced creatures to inhabit the planet. Before such Crustaceans, the Ediacarans were the first large, complex life forms on our planet, dominating the oceans for more than 40 million years. Researchers think they've found signs of "ecosystem engineering" by the then newly evolving, vigorous and active animals, such as snails and relatives of Crustaceans, who dug up ocean sediments, stirred up the water, and made the oceans uninhabitable for the sedentary and delicate Ediacarans. Meanwhile, above are two scenes loosely referenced in this video work . The significance of the currency of sand in contemporary "ecosystem engineering", its increasing depletion and the demand for its use in the making of concrete and glass for urban development, the dredging of ocean beds, and of subsequent global sand wars provide a key subtext for Barnacle City. 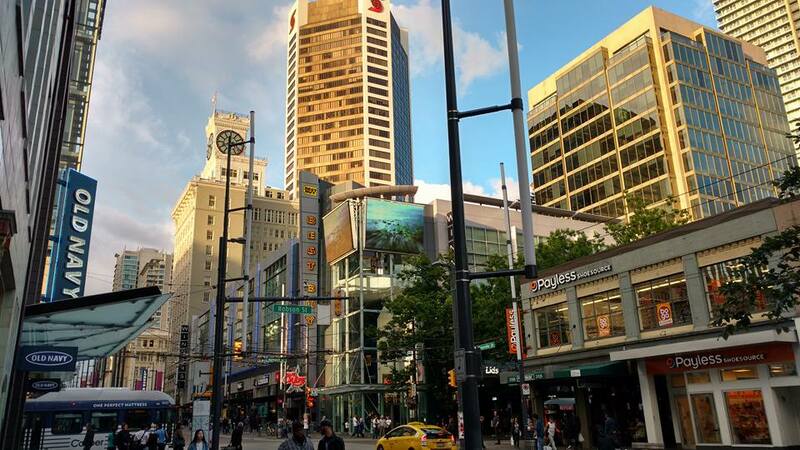 Additional venues include: the CBC Plaza on Hamilton St.; Telus Gardens on Georgia St.; the Terry Fox Plaza; the Vancity Theatre before each film screening and the Pacific Cinematheque, also before each film screening. Images contributed by various photographers, with thanks to Leah Weinstein, Anne Riley, Sharon Bayly and Dan Bull.